The European Court found a violation of Art. (3) of the European Convention on Human Rights on the grounds of unlawful violence by police officers against a Bulgarian citizen suspected of committing a theft. The case is classified into a second group of importance and is considered as a priority. On 20 February 2012, following a telephone call, the complainant voluntarily appeared in the police station in Pavel Banya. 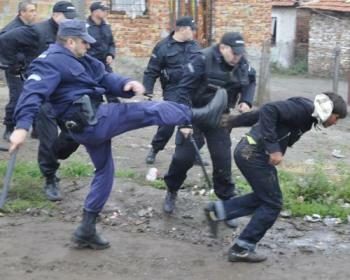 After responding that he did not know why he was summoned, three policemen began to beat him for several hours with a bat, a rubber baton, and use electric shock to admit he had committed a burglary. The battle is over when his nose is bleeding and suffers a lot of facial injuries. The applicant was released in about four hours, signing that he had not done the theft. The next day, he is certified by a doctor who detects bruises on the face and hematomas on the upper left side of the torso and left shoulder that could be obtained from stiff and blunt rounded objects. On 27 February the complainant filed a complaint with the Regional Directorate-General Kazanlak and the three policemen started disciplinary proceedings. It ends with the imposition of a disciplinary punishment on two of them due to unlawful detention - not to be eligible for promotion for a period of three years. No findings were made about the ill-treatment in the course of the disciplinary proceedings itself. For the third policeman, the Disciplinary Committee assumes that he has not been involved in the illegal use of force, so he has not been penalized. On the same date, the applicant appealed to the Regional Prosecutor's Office in Kazanlak. Pre-trial proceedings under Art. 131, para 1, item 2 in art. 130 of the Criminal Code (causing a mild bodily injury by a police officer while performing his duty). Since the punishment provided is up to 1 year imprisonment or probation, the court applies Art. Article 78a of the Criminal Code exempts the three defendants from criminal liability and imposes a fine of 2000 levs on them. He assumes that he does not have to impose additional penalty "deprivation of the right to exercise his profession", since he considers that the fine is sufficient to influence them to rethink their behavior. The decision was left in force by the District Court in Stara Zagora. The applicant's requests to the prosecutor's office during the pre-trial proceedings to file an indictment under Art. 282 and 287 of the Criminal Code are left out of respect. In 2014, the applicant brought an action against the State Agency for Regional Development in Stara Zagora on the grounds of Art. 1 of the SMRDA. The administrative court upheld the claim and awarded him compensation for non-pecuniary damage amounting to BGN 4,000. The case has not yet entered into force. The applicant raises a complaint under Art. (3) of the Convention, maintaining that the sanctions imposed on the three police officers who had practiced violence against him were not adequate to the severity of their conduct. The Court concludes that, in the present case, the actions of the three police officers should be classified as torture.